Deisy Madrigal was born and raised in Southern California. She is the daughter of immigrant parents and studied Criminal Justice and Criminology with a minor in Psychology at Metropolitan State University of Denver. For 19 years, Deisy worked with the Hispanic Center of Western Michigan as the Director of Family Support Services. In 2000, Deisy created and developed Project H.O.P.E. (Healing, Overcoming, Preventing, and Empowering) a program designed to work with Latin@ survivors of domestic violence and sexual assault. Project H.O.P.E. was the only Latin@ focused program that worked with survivors in Western Michigan. Deisy also facilitates a Spanish speaking support group for Latin@ survivors of domestic violence and sexual assault. In early 2018, Deisy left the Hispanic Center of Western Michigan and started working with the Community Media Center where she holds the position of Program Development Manager. Deisy continues to work with survivors on her own time and continues to facilitate the Latin@ support group. Deisy has also started working on opening her own Latin@ focused non-profit that will specialize in working with survivors of sexual assault and domestic violence. Deisy is tri-lingual, fluent in English and Spanish and intermediate in French. How did you come to be doing sexual assault work? When I became a Case Manager, people would come into my office looking for assistance. They, or someone in their family, had been sexually assaulted. When I would try and refer clients to mainstream sexual assault service agencies, they would tell me how they preferred not to go to those agencies. No one spoke their language and clients did not feel comfortable with the assistance they were receiving. As a child I was sexually assaulted by a person I was supposed to trust. My parents and I never received any assistance; we did not know that we could. I knew how I suffered and how it all affected my family and I knew that I wanted to help. I looked for trainings and started learning how to help survivors of sexual assault, then I had to relearn how to work with Latina survivors. Addressing sexual assault is very important because people are still suffering. There is still a sense of shame that survivors carry with them. Society is too scared to talk about sexual assault and step in when they have a chance to say something. Men still believe that they have the right to be sexually abusive, and the work that we are doing is helping to change all of these negative actions into positive. What I enjoy the best about my work is meeting so many strong women. Many of the women I work with forget how strong they are and watching them reclaim their strength is amazing. It is comforting to have support from a provider that understands you, your culture, your beliefs, and your fears. 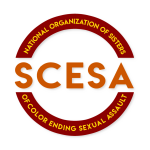 In Latino culture speaking of sexual assault is considered a taboo. My work allows me to break down those walls and stereotypes, and offers a safe place to start a conversation. Sexual assault is a lonely, depressing and frightening thing. When we address it to the community, we need to do so in a way that does not perpetuate those feelings. I have learned that I need to take the feeling of shame away for survivors. I learned that I need to talk about sexual assault from a place of strength, togetherness, support, and empowerment for all. I learned the importance of reminding survivors that they are strong. I spend time with my family. I like to read, and spend time in nature. On the weekends I like to be a tourist in my state of Michigan. I love going to new places and finding hidden little treasures. I also am a programmer on a community radio station that plays Spanish music, 88.1 FM El Mundo Musical, 3 days a week. What goals would you have for the sexual assault movement? Or yourself in doing this work? More immigrant Latina women need to feel comfortable enough to come forward and share their stories. Latino men being proud allies of the movement would cause a huge shift in the culture. My personal goal is to break down the walls that allow sexual assault to be so prominent in our community and shift the attitude so that any type of sexual abuse is unacceptable.